During a special afternoon of entertainment, discussion and reflection on migration in the context of global change, we showcased our CONTAINED trilogy of theatrical performances on migration. A very engaged audience of professionals from academics, theatre, arts, and civil society joined us to be inspired, exchange ideas and offer their feedback on the result of a year of hard work! 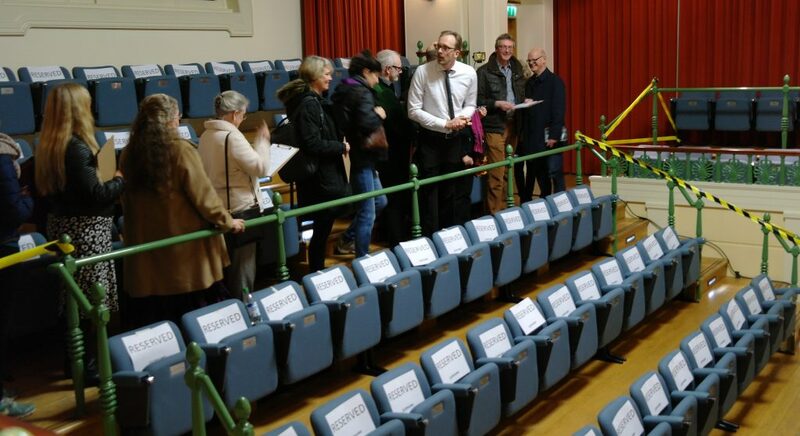 As they came into the theatre of Lady Margaret Hall, the unsuspecting visitors were immediately confronted with an extraordinary situation: All seats were reserved and although they had all signed up for the performance, visitors were given an application form to see if they would qualify for a seat. The waiting was long. Instruction words were incomprehensible. Some people were favoured while others were discriminated. The daunting and humiliating prospect of having to dance to obtain a seat led people to protest. In a discussion directly after the performance, audiences were asked for their observations, reactions and interpretations of the things they had seen and experienced. Finally, during the well-deserved drinks reception, our guests were given the opportunity to interact with the interactive tools from our Creative Lab, as part of the third part of our trilogy on Decisions and Journeys: play an eye-opening migration fact-checking quiz, write their own hero’s journey, or imagine how they would prepare for a journey. At this closing event of the pilot phase of CONTAINED Project, we were able to share the results of our search for the most effective means for using theatrical tools to discuss migration and challenge perceptions and opinions. During this pilot phase, we have trialled new styles of performance and audience interaction in ways that we hadn’t done before. We learned that both a full-length complex artistic production and short pop-up immersive or participatory interactions can be very effective in provoking thoughts and stimulating dialogues. In the future, we will pick up on these lessons to build these performances and CONTAINED Project further! This was the closing event of the CONTAINED trilogy of performances that connect experience, research, and creative learning to create dialogues and understanding about migration. This event was funded by the ESRC Impact Acceleration Account, and by the TRANSMIC Marie Curie Initial Training Network, a project funded by the European Commission’s Seventh Framework Programme. 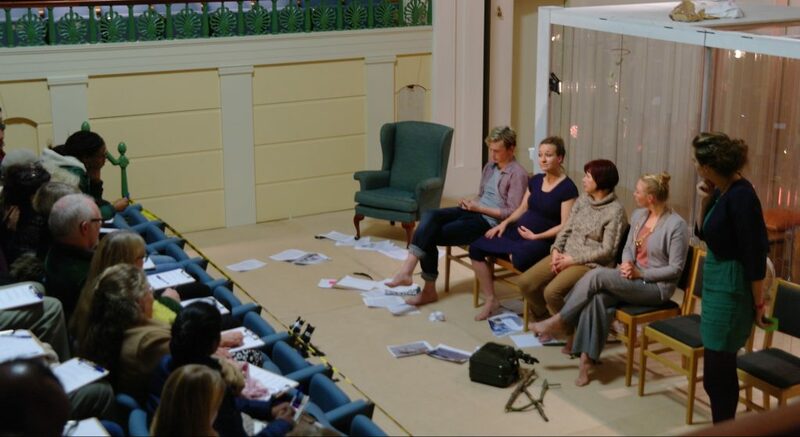 The team of the CONTAINED trilogy at Lady Margaret Hall consisted of: Creative Director Anja Meinhardt – Research Director Marieke van Houte – Script Joakim Daun – Performers Judith Von Orelli – Peter Dewhurst – Fiona Watson – Anja Meinhardt – Steve Hay – Remco Heijmans – Brittany Roberts – Marieke van Houte – Music Quentin Lachapele – Lights James McKeogh – Film Ben Johnston – Set Simon Dormon – Costumes Suzie Burlton & Zoë Parkinson – Producer Johnny O’Reilly Production Assistant Brittany Roberts.